Trial closes are important, but not as much as you might think. Trial closes get a lot of coverage in sales literature as do closing techniques in general. I believe they get far too much exposure. The way many so called sales experts drone on about them, you’d think they were one of the biggest secrets to selling. They aren’t. 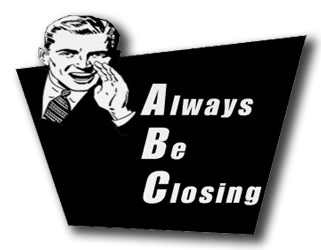 The oft quoted acronym “The ABC’s of sales – Always Be Closing” is just plain wrong. Closing question = Any question that when answered in the affirmative, means that the customer has bought. A trial close differs from a closing question in that there is a condition attached to it. Trial close = A question that confirms the buyer’s interest in purchasing if certain conditions are met. An example of a trial close would be, “If we could solve the problems we spoke of in a cost effective way, do you think we could do some business together?” A trial close is like testing the water before you jump in. It’s a way to gauge interest without asking the buyer for a full commitment. Trial closes are very powerful in helping understand where a buyer is in the decision making process. You can more easily determine their level of seriousness in solving their problems with either your solution or your competitor’s. They are also very helpful in fleshing out what obstacles might stand in the way of making the sale. Often, the buyer will share what concerns they have or what things are most important to them. A trial close will not save bad selling skill up to that point in the sale! Too many times, salespeople fail to uncover problems with the buyer, fail to help the buyer understand the full negative implications of these problems and finally fail to convey in a compelling & ironclad manner how their solution will help. And after failing on all fronts, these salespeople, because they’ve read to “ask for the order at least 3 times” go ahead and do a series of trial closes followed by repeated asking for the order. If the customer isn’t convinced that a) they have a problem that urgently needs to be solved and b) you’re the best way to solve it, you can ask for the order until you’re blue in the face but it’s not going to help. In fact, research shows that in large transactions, asking for the order more than once actually reduces your chances of closing. This is when customers may openly show signs of frustration. On the other hand, if you are skilled and have helped the customer understand why their problem is big enough to warrant solving now and have proved to them that you are going to solve it, a trial close will be low pressure, reasonable and natural. I’m going to share a story of poor selling technique and how it can lead to disaster. After dinner tonight, I got a call from the major bank that has the mortgage on our vacation property. Naturally, when I saw the name pop up on call display, I answered it thinking that it must be important. Me: “Keith. I’m looking at my calendar and it says March 3rd. Why would I want to decide on that right now if it’s not due until the middle of the summer?” This objection came up because Keith failed to find the problem with leaving the decision until later. Me: “That doesn’t sound like much.” I’m getting frustrated at this point because I don’t see any meaningful problem that is being solved for me. Me (chuckling): “Keith, for thirty two dollars, I don’t think it’s worth the time and hassle.” My frustration is turning to annoyance at this point. This is a beautiful example of trial closes and unconvincing objection handling being used in lieu of strong selling technique. Northbound’s Goal Aligned™ Selling program helps you understand your customer better and fit your solution to them. To arrange a complimentary live workshop for your team, contact Michael Caron at mcaron@northboundsales.com or 416.456.1440. I had the same phone call. There is a time and place for a trial close and it can be a useful tactic if you are prepared for follow questions.